The Hub, a new community space at the Otay Ranch branch library, is now open, thanks to partial funding from the Friends and the Chula Vista Public Library Foundation. The library has leased the 2,000-square-foot space, formerly a Gepetto's retail store, from Otay Ranch Town Center through 2017 and will staff it during regular library hours. The space features movable partitions, new lighting, free Wi-Fi, and furniture that can be easily moved to accommodate community meetings, after-school homework sessions and even small performances. The library's popular storytimes, which frequently draw up to 100 attendees, will be held in The Hub as well. Chula Vista artist Katarzyna Lappin was the guest speaker for the annual meeting of the Friends of the Chula Vista Library on Sunday, January 27. 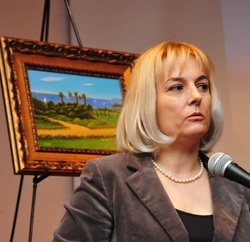 Lappin, who created 20 oil paintings for the city's centennial celebration in 2011, showed samples of her artwork and, in a video created by her husband, Daniel, explained the inspiration for each piece. 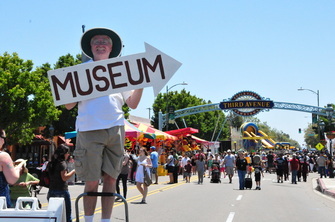 The paintings feature various local landmarks, including Chula Vista's "orchard houses," Otay Lake, the bayfront salt works and downtown Third Avenue. Another depicts her young daughter browsing the shelves at the South Chula Vista Library. Prior to the program, Friends executive board president Shauna Stokes outlined the group's contributions in 2012 and its goals for 2013. Members also re-elected Jim McVeigh and Imozelle McVeigh to three-year terms as executive board treasurer and secretary, respectively. "This Land Is Your Land, This Land is My Land," an exhibition at the Chula Vista Heritage Museum, continues to draw visitors interested in learning more about the history of the Japanese in the South Bay. Featuring artifacts and photographs from the Japanese American Historical Society of San Diego, the exhibit will be on display through May 30. 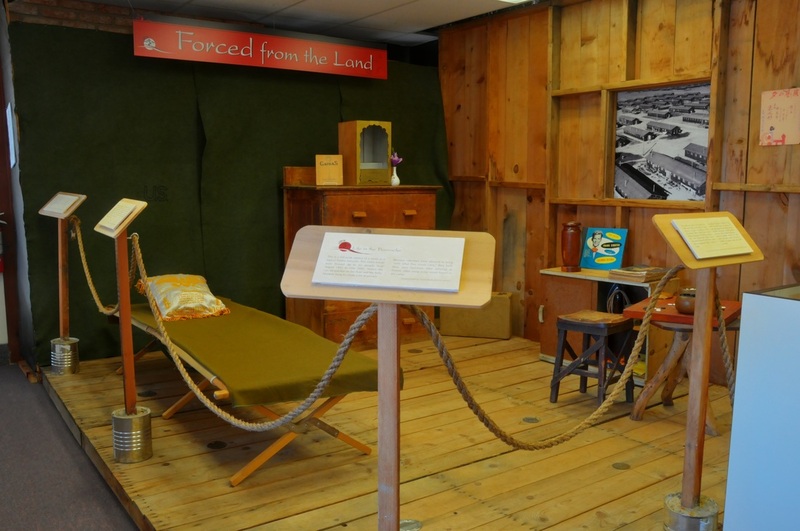 Centerpiece of the exhibit is a replica of a room in the Poston, Arizona, barracks where about 450 Chula Vistans were interned during World War II. If your holiday haul included an iPad or another e-reading device, library staff are ready to help you check out and read books from the library's virtual collection. The free "E-books 101" classes will be held from 4 to 5 p.m. on Wednesday January 16, 23 and 30, at the Civic Center library. Classes are limited to those 17 and older, and registration is required by visiting the library's website. Anyone with a current card can also check out digital books for free through the website. After installing the free software, users can easily download books to their preferred devices, including PC and Mac computers, iPads, Nooks, Sony Readers, and more. Titles will automatically be deleted after 14 days – no late fees! Powered by OverDrive, the program is funded by a California State Library grant through the Serra regional library cooperative. Classes for prospective U.S. citizens are held at the Civic Center Library from 6 to 7:30 p.m. each Tuesday. Sponsored by the non-profit organization Moving Forward to Changing Directions, the free, ongoing sessions are offered in English and Spanish. Services include include citizenship classes, one-on-one or small group tutoring, practice interviews with a trained volunteer or staff member, assistance with citizenship applications, and referrals for legal advice. Trained volunteers will teach U.S. history and civics, interviewing skills and civic engagement. Participants will also study the reading, writing, speaking and listening skills needed to pass the citizenship test. For more information or to register for the next new student orientation, call Moving Forward to Changing Directions at (619) 955-7030. Speaking of big dreams . . . . The new Otay Ranch library has been hugely successful, with more than 27,000 visitors and 2,000 library cards issued in its first two months of operation. To ensure that the branch will continue survive and thrive, the Friends executive board hopes to organize an Eastside chapter of the Friends. 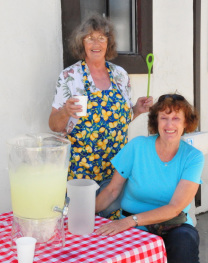 Please join the board and library director Betty Waznis at an informal meeting at 11:45 a.m. Thursday, June 28, at the Otay Ranch branch. Attendees will have an opportunity learn more about the Friends organization and its mission of fund-raising, volunteerism and advocacy on behalf of the library. Read the UT article on the June 19 Council vote, and an article on the public hearing. Read a press release from the Friends of Chula Vista Parks & Recreation in opposition to the consolidation. And read the city manager's memo in response to a similar proposal in 2011. Entertainment for the opening celebration will include two sets of World War II-era music by Downbeat Big Band and a performance of selections from Allegiance – A New American Musical. The musical, set in a Japanese internment camp during World War II, will have its world premiere at The Old Globe in September. 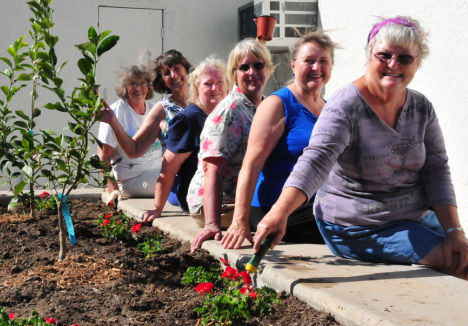 Members of the Chula Vista Garden Club and museum manager Ada Dean (far left) recently planted several "Chula Vista geraniums" outside the Chula Vista Heritage Museum. The organization plans to plant the bright red hybrid geraniums in locations around the city in honor of the 2011 centennial. 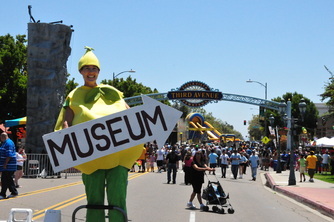 Earlier, Museum Board members David Danciu and Peter Watry planted two lemon trees in the bed as a nod to Chula Vista's one-time claim as the Lemon Capital of the World. 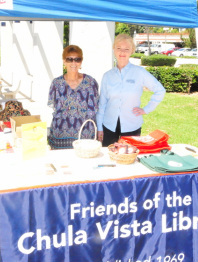 Book fund info: In addition, the Civic Center chapter of the Friends has pledged $12,000 and the South Chula Vista chapter has pledged $5,000, primarily from proceeds from their used book sales. Proceeds from online book sales are expected to bring in an additional $7,500. Funding info: Libraries and literacy programs across California will be at risk if the state budget “trigger” is pulled after January 1. The proposed cuts to state funding for library services would dismantle the cooperative lending program that allows libraries to share resources – and could possibly result in the end to free services for non-residents. 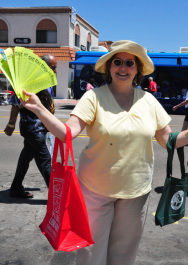 Chula Vista Public Library director Betty Waznis says a loss of funding could affect the system of “universal borrowing” that allows Chula Vista residents free access to the Bonita library, and vice versa. Fees of $50, $75 or even $100 could become the norm. The budget trigger would also eliminate literacy programs that serve approximately 20,000 adult learners in California and would jeopardize about $15 million in federal funding for Braille and Talking Book library services. In Chula Vista, state library dollars support the 40 or so tutors who help more than 100 students develop essential skills in reading and writing. Also at risk is the opportunity for libraries to apply jointly for funding, such as the recent grant that allowed Chula Vista to cooperate with 12 other libraries in San Diego and Imperial County to offer downloadable “e-books” at no charge. The California Library Association is encouraging library patrons to contact Governor Jerry Brown and urge him to “spare public libraries from the trigger.” A strong grass roots effort is essential if library services are to remain funded through the second half of the fiscal year. Letters should be sent to the Governor and local representatives, as well as to leaders in the state Senate and General Assembly. Mail and fax contacts are listed below; click on the appropriate link to send a message via the legislator's website.